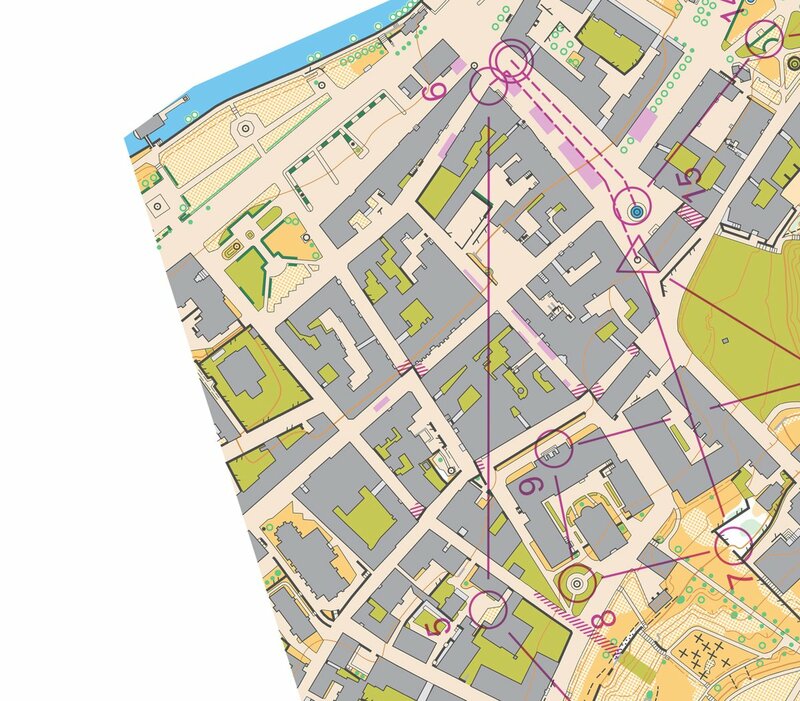 Home / Orienteering News / WOC Sprint 2017: BIG Analysis & Why did Daniel win? 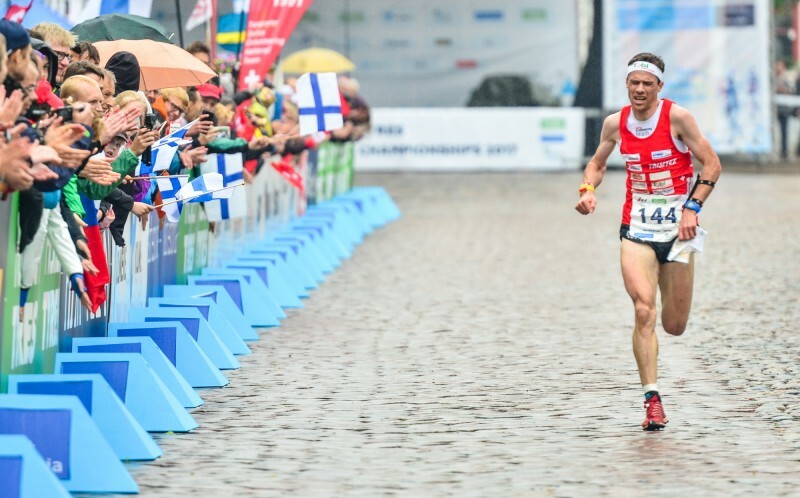 WOC Sprint 2017: BIG Analysis & Why did Daniel win? 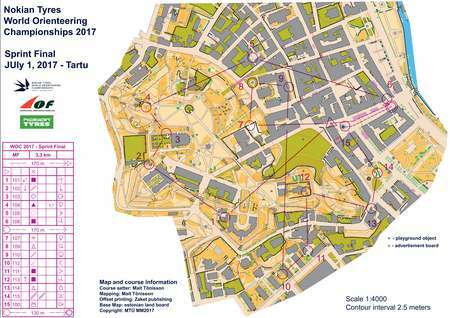 The Tartu World Championships Sprint courses did have several interesting routechoice legs where many athletes lost significant time. Some of them were “traps” specifically made to trick the runners into making mistakes, others were long legs were the runners struggled identifying the right choice under pressure. None of the top placed athletes managed to run a clean race. 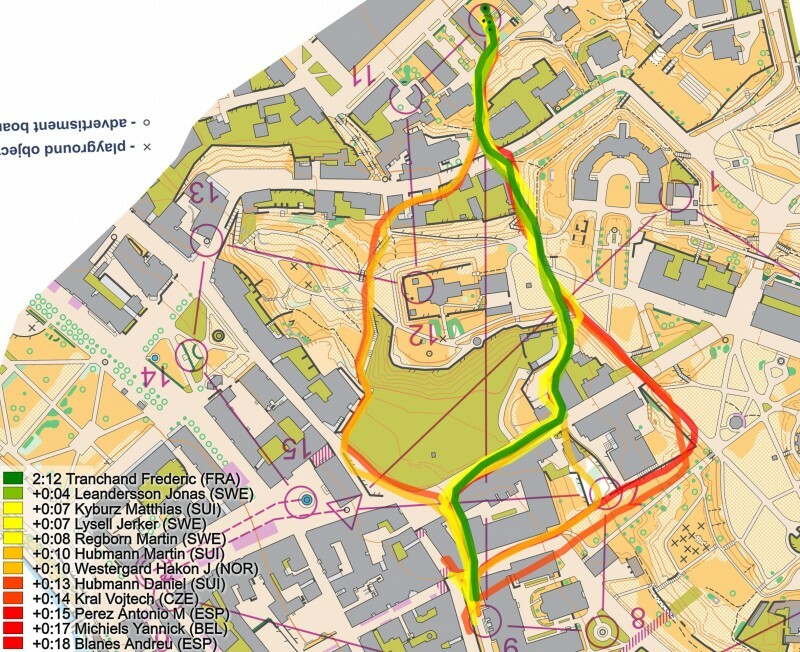 Daniel Hubmann won the race by running more consistent with less mistakes than the others in addition to very high speed in the last part of the course – but even Hubmann lost around 15 seconds due to bad technical execution – once running into a forbidden area and in addition going into the course setters trap to the second last control. 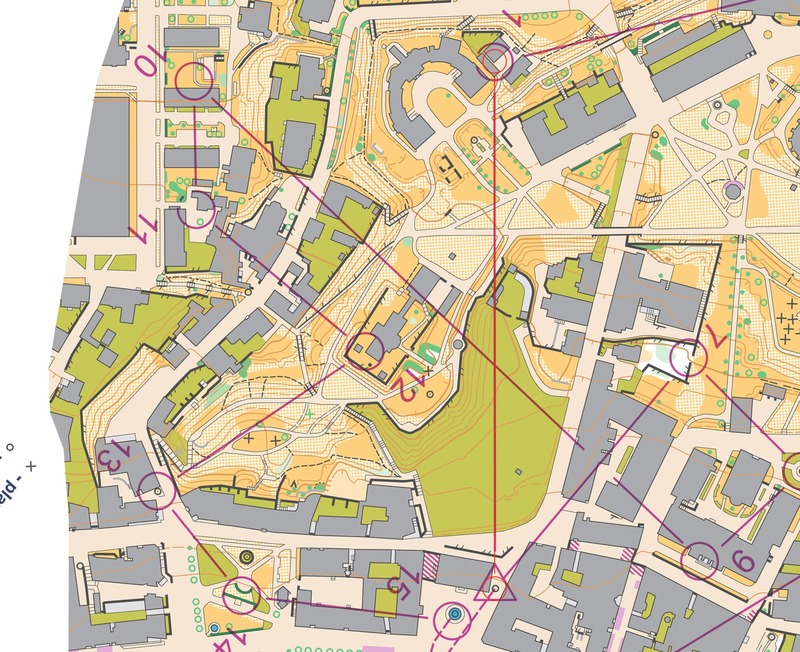 Jonas Leandersson was the man with the highest speed – but the Swede who was in the lead at control 11 of 15 did several mistakes towards the end, losing nearly 30 seconds to “superman” on the last 4 controls (control 12 was his biggest time loss, see the map sample above). Matthias Kyburz and Jerker. Lysell also had higher speed than Hubmann, but also lacked the consistency of Hubmann. Frederic Tranchand had lower speed – but his consistency secured him the silver medal. The other big favourite of the day, Belgium’s Yannick Michiels, had a very bad day technically, losing 10-20 seconds on several routechoice legs early in the race. 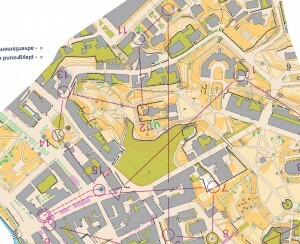 The following analysis goes through the decisive points in the course – showing where the victory or medal chance was lost for the runners who had the speed for a top result. 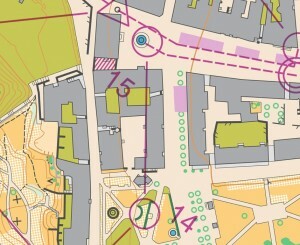 For maps, GPS-tracking and results from the race, see this summary article. Who had the speed for Gold? Here are the results for Top 15 (times rounded to whole seconds) with the runners with the speed in the same order as the winner Daniel Hubmann or higher marked in red. There was also one runner outside Top 15 with top speed in this range; the Norwegian Øystein Kvaal Østerbø, but the technical execution was far from the best. Already the first leg brought an interesting route choice for the runners -a route choice were several runners lost 10-20 seconds. Here it is clearly best to choose the alternative in the middle because it is shortest and has least climb. Note how tricky it is to see the passage straight – and also the bridge and the olive green make it difficult to spot the best routechoice here. Notably Yannick Michiels lost his chance for gold already here by taking a routechoice to the right and losing 26 seconds to Emil Svensk’s best time. The reason for losing so much by going right is firstly that it is longer, and second that you run up on a hill and down again. Of the Top 15 finishers, two runners took the left choice, Hodkinson and Blanes, losing 20-25 seconds to the best split time. 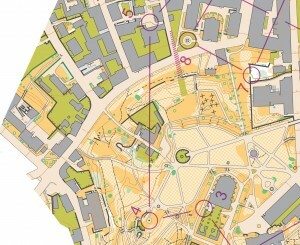 20-25 seconds is a lot in modern sprint orienteering. Really a lot! The rest of the Top 15 finishers took the right routechoice, but there were still significant time differences – several losing 7-10 seconds here to Emil Svensk’s best split time – 2 seconds less to Matthias Kyburz who has the second best split here. Tranchand and Lysell are already 7 and 8 seconds behind after only one control. Leg 5 is another long leg where several runners lose time. 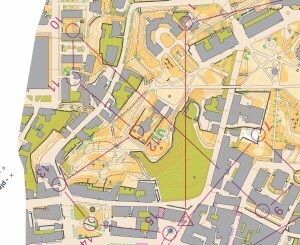 Michiels again does a mistake and goes all the way around to the right (a bit farther than indicated by the GPS-track). Regborn loses 10 seconds and Kyburz loses 5 seconds. Westergård also has an 8 second time loss here. The time losses are mostly due to running longer, but also partly due to slower runnability on the small paths/grass and partly may also be attributed to running speed. Looking at the standings at control 5, Leandersson is in the lead just ahead of Daniel Hubmann and Lysell. Except for Michiels, the others losing time are Matthias Kyburz (11 seconds), Andreu Blanes (9 seconds) and Jonas Leandersson (8 seconds). Note that the GPS is a bit off in this area due to the buildings. 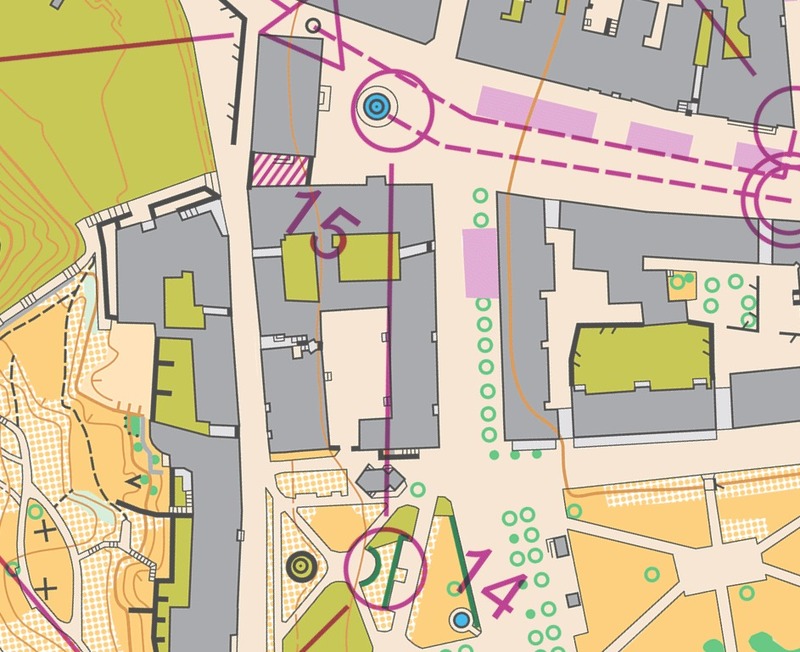 This is definitely the place in the course where Kyburz loses the victory to his team mate Daniel Hubmann – 12 seconds lost here while Kyburz is only 6 seconds from Gold in the end. Leg 10 is another longer routechoice leg – a leg where the runners spread on widely different routes. Tranchand runs this leg extremely well, winning the leg with 4(!) seconds. Again Michiels loses time (17 seconds) on a wrong route, along with the two Spanish runners (15 and 18 seconds) and Vojtech Kral (14 seconds). 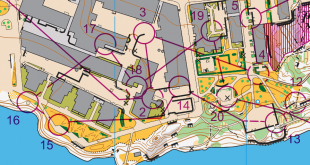 Daniel Hubmann loses 13 seconds due to running into a forbidden area (and out the same way again; a gate is open here while being marked as an artificial fenve on the map). Matthias Kyburz loses 7 seconds to Tranchand by doing something similar as Hubmann. 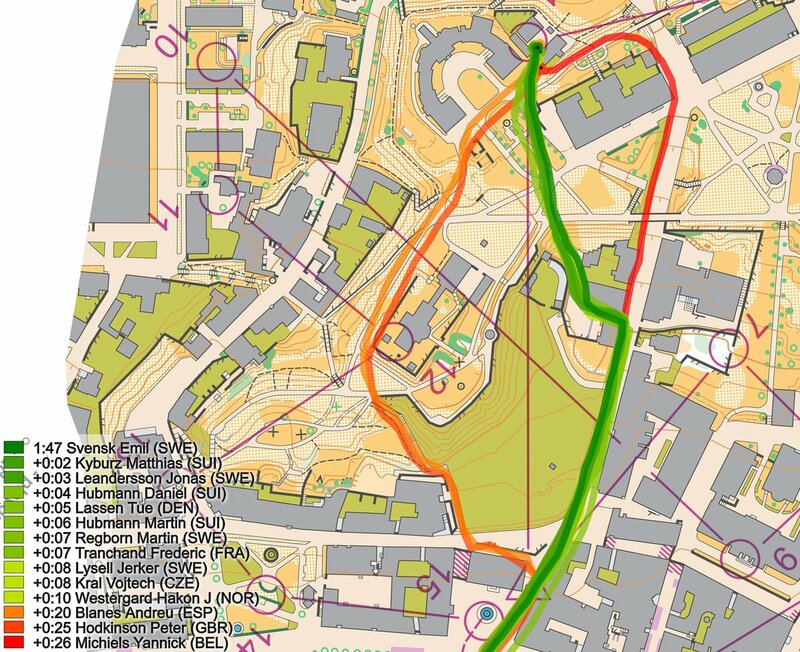 The reason for the timelosses here is partly the runners who run into the forbidden area, and partly that the alternative routes are longer; running speed also has some importance here towards the end of teh course. Looking at the stadnding at control 10, Leandersson is now in the lead with 2 seconds ahead of Tranchand and with Hubmann in 3rd at +0:06. Kyburz is as much as 12 seconds behind in 5th. 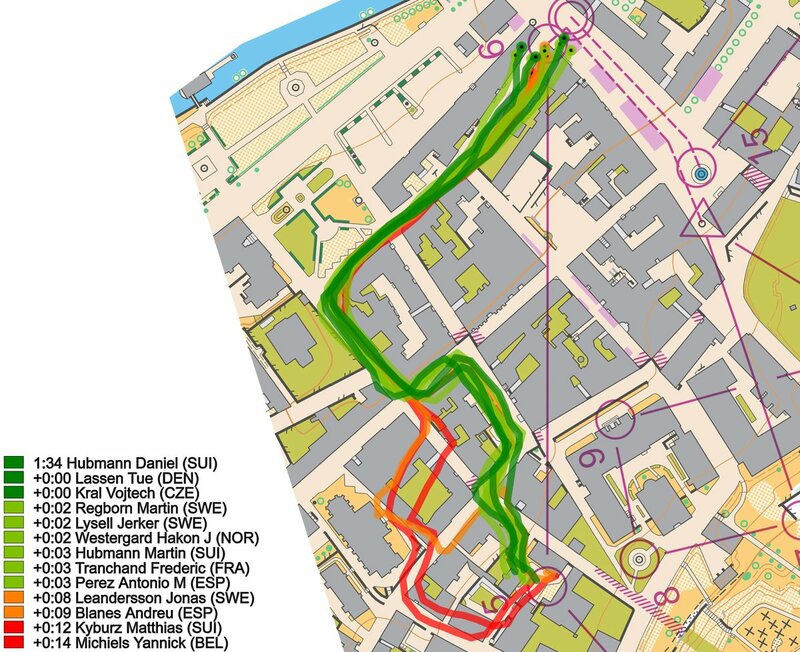 The most decisive route choice when considering all athletes in the final was the leg to control 12. Jonas Leandersson looses 14(!) seconds here, and suddenly Leandersson is down in 4th place. Daniel Hubmann takes over the lead with Tranchand in second and Lysell in third – this is actualle the medal order. Note how Hubmann runs the leg extremely well and wins it with 2 seconds down to Kyburz. Note also all the runners losing significant time – 11 of the runners lose 20 seconds or more. Time losses here are mostly due to running much longer on the last part of the leg (going around the house to the left, which is significantly longer. 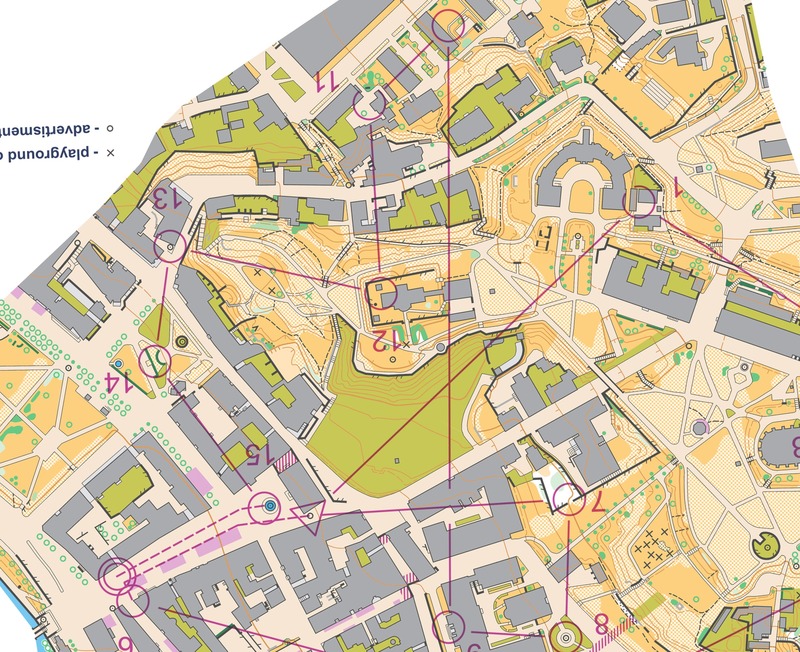 The leg to the last control is the last challenge on the course, and quite a few lost 5-10 seconds here. 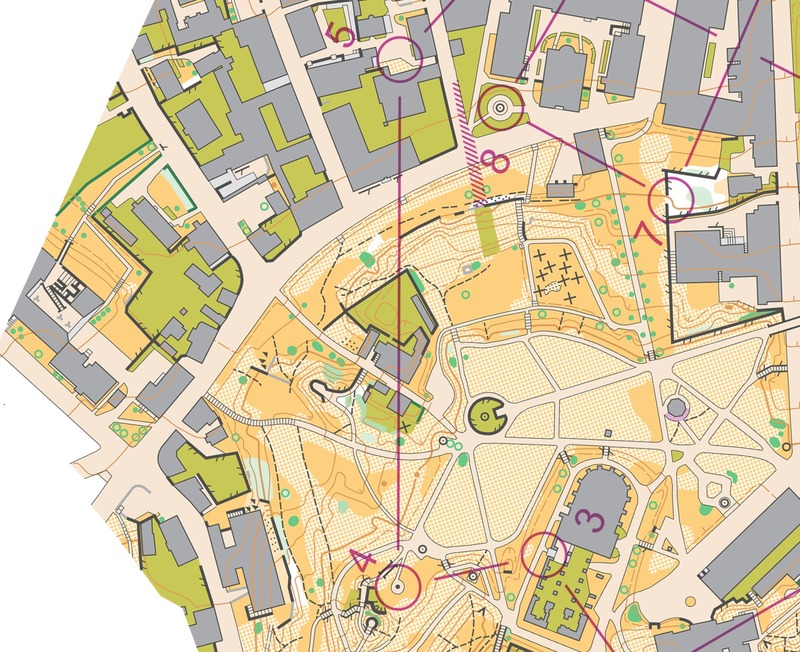 This is actually a trap by the course setter; if you look carefylly at the map you see that there is olive green (forbidden area) if you go straight. Many didn’t notice and started runing in the direction of the forbudden area out of the control. This cost them 5-15 seconds. Finally a results overview table where you can see where each runner lost time compared to a “typical” time for this runner – based on an algorithm which calculates a “typical” time for each athlete.